A home is intimately tied to the health and wellbeing of its residents. It is where people go to take care of themselves and seek comfort. People in the United States spend approximately 70% of their time at home, which means that ensuring homes are a healthy refuge is vitally important. 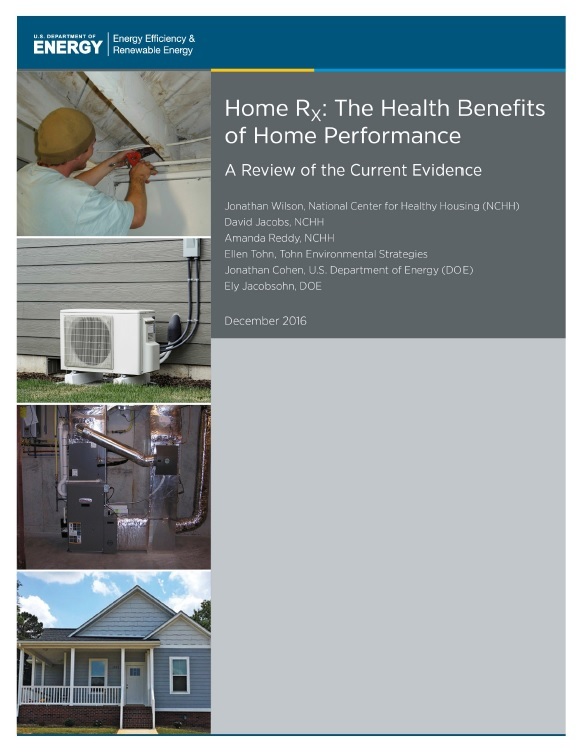 Evidence in a new DOE report, Home Rx: The Health Benefits of Home Performance (PDF, 1.4 MB), shows that home performance upgrades can improve the quality of a home’s indoor environment by reducing the prevalence of harmful indoor air pollutants and contaminants. Until recently, however, no systematic review of this evidence had been conducted, limiting full understanding of the link between home performance and health. New research by the Energy Department sought to close this gap by documenting the full array of health benefits for homeowners and their families stemming from home performance improvements and green renovation practices. Ranging from general health improvements to measurable reductions in asthma symptoms and other respiratory illnesses, these benefits complement the energy cost savings and comfort improvements frequently produced by home performance upgrades. In some instances, the health benefits associated with home performance were shown to reduce both healthcare utilization and costs. Some of the home performance improvements considered in the report include those provided as part of the Energy Department’s Weatherization Assistance Program, such as air sealing, insulation, lighting, and adequate ventilation. Also considered were common green renovations as well as additional home performance upgrades supported by the Energy Department’s Home Performance with ENERGY STAR (HPwES) program, including ventilation upgrades, moisture control, window replacements, and allergen-reduction repairs. It was presumed that measures installed for the purpose of achieving verified health benefits would be compliant with industry standards and subject to third party quality assurance. Therefore, the potential health consequences of improper design, inadequate installation, insufficient maintenance, or equipment failure were not investigated. This paper is just one part of the Energy Department’s broader Health and Home Performance Initiative. This paper will serve to advance about the market for the health benefits of home performance, including how these benefits can be better articulated both within the home performance industry and in policy. The purpose of the Initiative is to support the energy efficiency industry’s engagement with the healthcare sector to find ways to account for the benefits of home performance work and to make it more accessible to populations of people who want and need these services. The next step for the Initiative will be to engage with stakeholders to develop a roadmap to facilitate industry’s incorporation of health benefits of home performance into their work. Workshops are slated for conferences in January, March, and May. To learn more about the Health and Home Performance Initiative, and to be involved in development of the roadmap, email homehealth@CSRA.com.